Do you have a favorite Superhero? 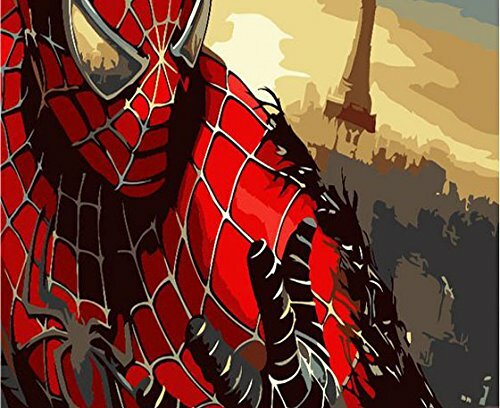 If so you might want to try one of these Superhero Paint by Number Kits. 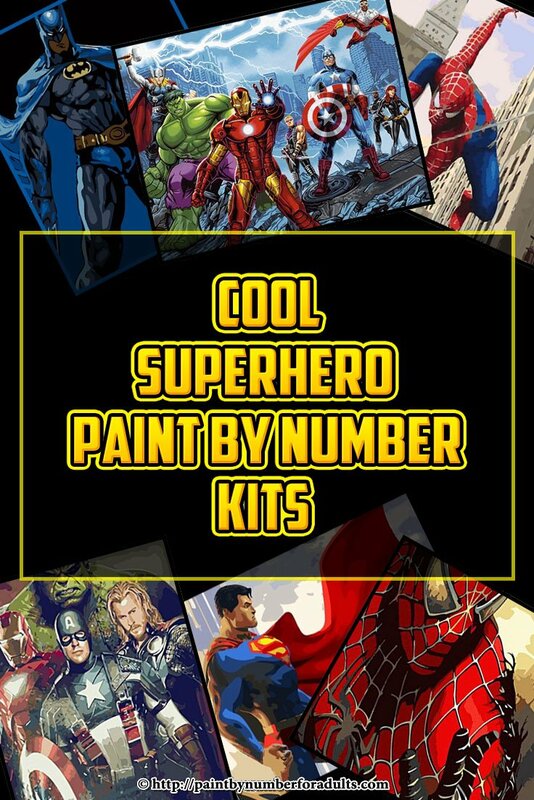 Any of these Superhero paint by number kits would not only be super fun to work on but when your painting is finished it would look totally awesome framed and hung on the wall. 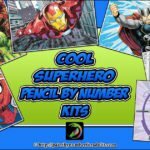 If you’re thinking of buying a few Superhero Paint by Number Kits your best bet is to shop for them online. First of all the selection is much better than in your local shops and secondly the price for these paint by number kits are pretty reasonable. 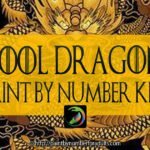 Below I’m found a few cool Superhero paint by number kits, however as I find more I’ll be updating this page when I find a new one. 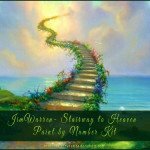 So have a look at the kits that I’ve come up with and hope you find something that you’ll enjoy working on. This Avengers superhero paint by number kit by Dimensions Paintworks measures 20 inches by 16 inches and comes with everything needed to complete the painting. 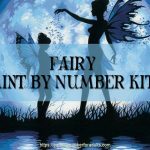 You’ll find that the members of Marvel’s powerful and prestigious superhero team, come to life in this fun paint by number kit. 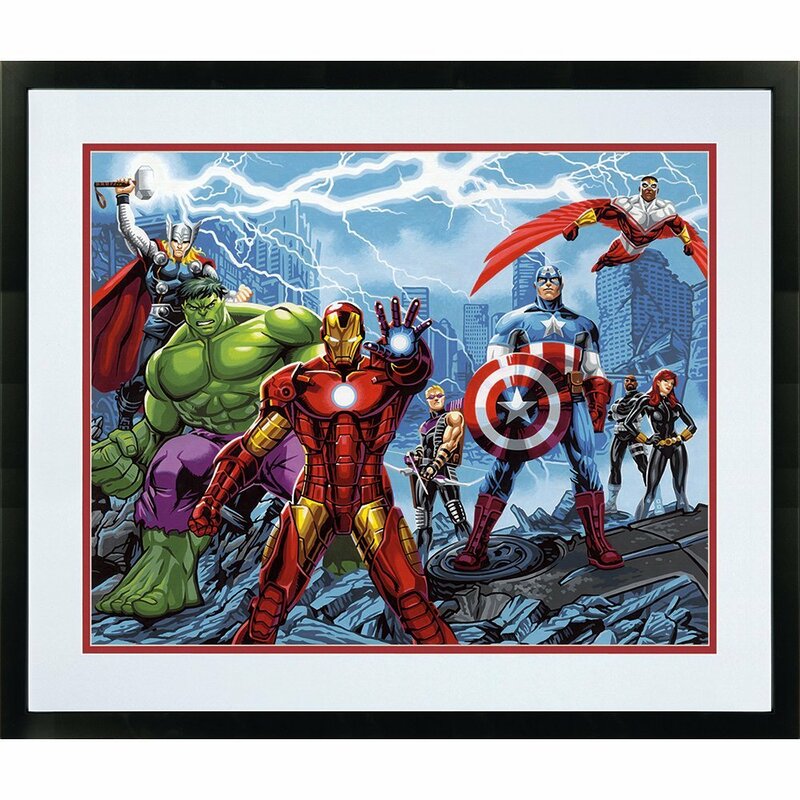 Whether you are a fan of Avengers comic books or the movies, this painting makes a great collector’s piece. 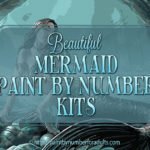 This kit comes complete with acrylic paints, paintbrush, printed art board, and a set of easy instructions. NOTE: You might want to pick up a few extra paintbrushes for doing details because the kit only comes with one #1 round brush. With this set you’ll need to do some blending but it’s usually 50/50 mix. This cool Spiderman paint by number kit measures 20 inches by 16 inches and comes complete with everything to complete the painting. The kits comes with a pre-printed canvas stretched on a wood frame, 3 paint brushes, enough acrylic paint to finish the painting. 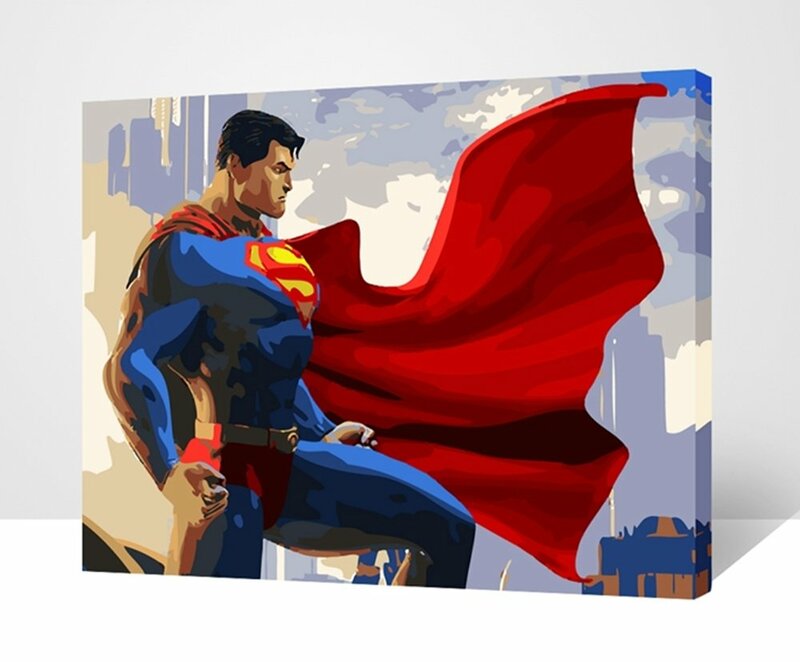 This cool Superman paint by number kit measures 20 inches by 16 inches and comes complete with everything to complete the painting. 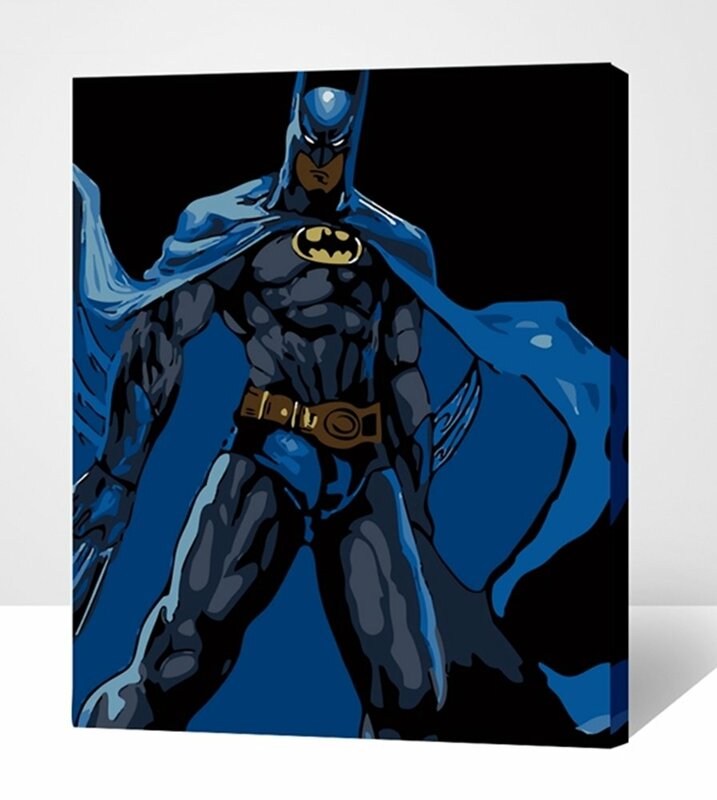 This cool Batman paint by number kit measures 20 inches by 16 inches and comes complete with everything to complete the painting. 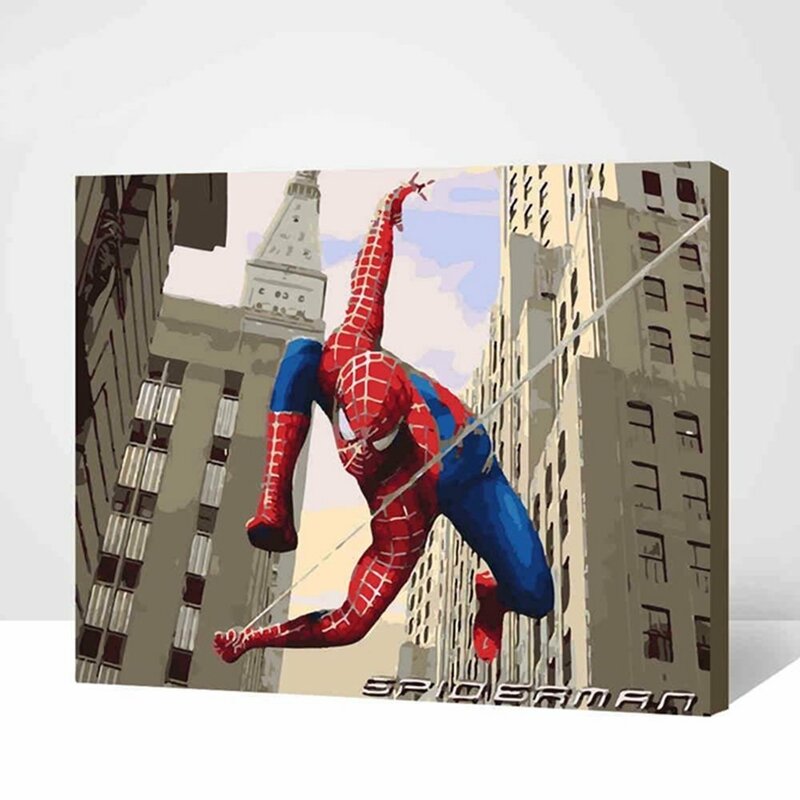 This Spiderman paint by number kit is pretty cool and measure 20 inches by 16 inches and comes with a pre-printed canvas textured canvas that is framed, 3 paint brushes and enough acrylic paint to complete your painting. 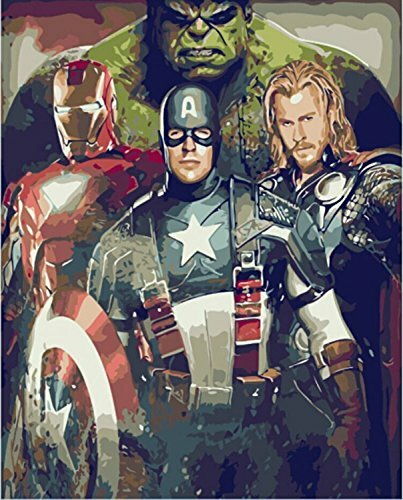 This Avengers paint by number kit comes with a pre-printed framed canvas and everything you need to complete the painting. 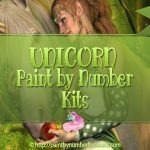 You get enough acrylic paint to complete painting and 3 paint brushes and a set of easy to follow instructions.